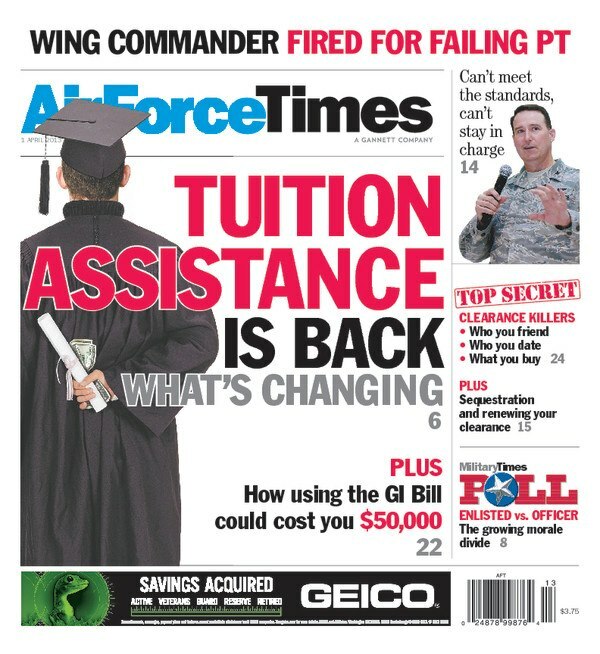 Congress has ordered the Air Force to restore tuition assistance after the service suspended the program for the remainder of this fiscal year due to budget cuts. But the program may not be entirely free when it comes back, and there might be limitations on what courses you can take. You can read more about what to expect in this week’s Air Force Times cover story. Also in this week’s edition, Air National Guard Director Lt. Gen. Stanley Clarke talks about how the Guard and Reserve will weather the fiscal storm. Amid sharp decreases in defense spending, the Guard is prioritizing which of its missions come first, such as helping fight wildfires. In other news, a recent incident involving an Iranian fighter and an MQ-1B Predator shows that sometimes unmanned aircraft are escorted by U.S. fighters. Experts explain when unmanned aircraft get escorts by vastly more expensive fighters. Meanwhile, in a new feature called “Five Questions,” astronaut Buzz Aldrin talks about the prospects of a mission to Mars and why he punched a conspiracy theorist who claims the Apollo 11 moon landings were a hoax. And a group of airmen plan to climb Mount Everest to raise money for charities and commemorate fallen airmen. The U.S. Air Force Seven Summits Challenge has already scaled six of the world’s seven highest peaks.